Money Secrets of the Amish by Lorilee Craker is a money saving book for all types of people. Sure, we won’t all cut back to only one useful present for birthdays or Christmas, but the tips included can help save your family a tremendous amount of money – if you use them. If you need new financial ways to help get out of debt, this is a great book to read to help you get back to the basics. “Discover the money-saving and wealth-building secrets of America’s thriftiest people, the Amish. Author, journalist, and descendant of the Amish, Lorilee Craker, was just like the rest of us, feeling the pinch from the financial fallout of 2008. As a freelancer, her income was going the way of the dodo—family dollars seemed like an extinct myth, the bank account some archeological evidence of past prosperity. Money Secrets of the Amish is actually a very funny and cleverly written financial help book. The unexpected witty humor was quite a nice treat because who really enjoys reading about money besides bankers? Maybe that is why everyone is in such financial trouble, besides of course learning at a young age that you deserve everything you want. Sure, if you can afford it, right? Well, kind of. Thoughts like that are what make millions of people go bankrupt and in debt. Going back to how things used to be is still actually done by the Amish people. They have really good financial records and continue to thrive in today’s economy. Something can definitely be learned from that. This book focuses on all of those budget conscious things that the Amish naturally do. They just take it to the extreme. For them it is normal, but for everyone who isn’t Amish, I really don’t think cutting back so far as having no electricity, sharing clothes and never buying new, making everything you can yourself, and only receiving one present on a birthday or on Christmas probably is going to happen. 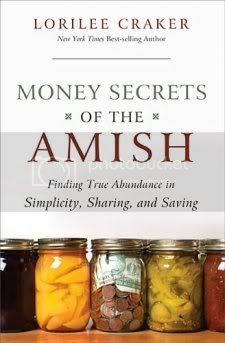 The author also agrees on that and instead gives ideas on how you can make do with what you have and save money similar to how the Amish people do. Nothing is really “new” about the tips but they are still helpful to remember. Try these tips out for yourself and start seeing savings quickly! Very interesting. Thanks for the review. Will have to check that one out. I’ve enjoyed all of Lorilee’s books, but I especially loved this one. The author wraps some great nuggets of wisdom in a fun-to-read book. I think it’s got some common sense tips, in a format that’s accessible to someone who wouldn’t typically pick up a book on finances. The author’s own “money makeover,” documented with humor, made me believe I could take the same simple steps to save money and live better.